Winter may be officially over, but the evenings are still chilly, and I find myself craving warm, hearty, stick to your ribs kind of meals for dinner. So this past week, I whipped out my trusty Instant Pot, and threw together a most insanely delicious Beef Ragu with Spaghetti Squash. It has all the incredible flavors of a traditional slow cooker beef ragu, but it’s made in a fraction of the time. The beef is so moist and succulent, and each ingredient in the sauce comes together to create a most beautiful harmony of flavors. An Italian cuisine, Beef Ragu is a meat-based sauce that is typically served over pasta or noodles. 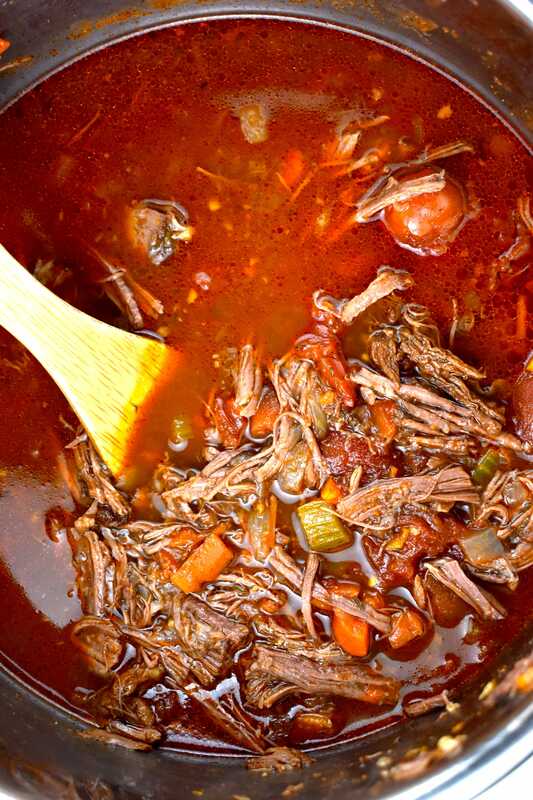 The basic preparation is slow cooking over a low heat. Tomatoes are often used in the sauce, but limited so that the meat is the star of the dish, making ragu more of a meat stew, rather than a tomato sauce with meat added to it. There are lots of different ways to serve a beef ragu. The way I’ve seen most frequently is over pappardelle pasta noodles. The wide, flat surface of these noodles is basically the vehicle for all those luscious chunks of meat to ride in on. No doubt about it, it is so incredibly yummy, and my favorite way to eat it when I’m not counting calories. But if you want to keep your carb and/or calorie count low, serving it over a vegetable is an amazing way to still indulge in this decadent dish. I opted to have my beef ragu over fresh roasted spaghetti squash, and I cannot even tell you how GOOD this was!! I know that some people can be a little intimidated by the thought of cooking spaghetti squash, so here’s a basic, step-by-step process on how to do it. Preheat oven to 400 degrees. Line a baking sheet or baking dish with parchment paper, and lightly mist with oil or cooking spray. Slice the spaghetti squash in half lengthwise, from stem to tail, and scoop out the seeds. Drizzle with olive oil (or lightly mist if you are trying to keep the fat and calories low), and season with salt and pepper. Place the squash, with the cut side facing down, onto the baking sheet or dish. Place in the oven and roast until tender, about 45-60 minutes, depending on how large your squash is. Remove from the oven, and let cool until it’s able to be handled. Using a fork, scrape out the flesh, creating the “spaghetti” strands. 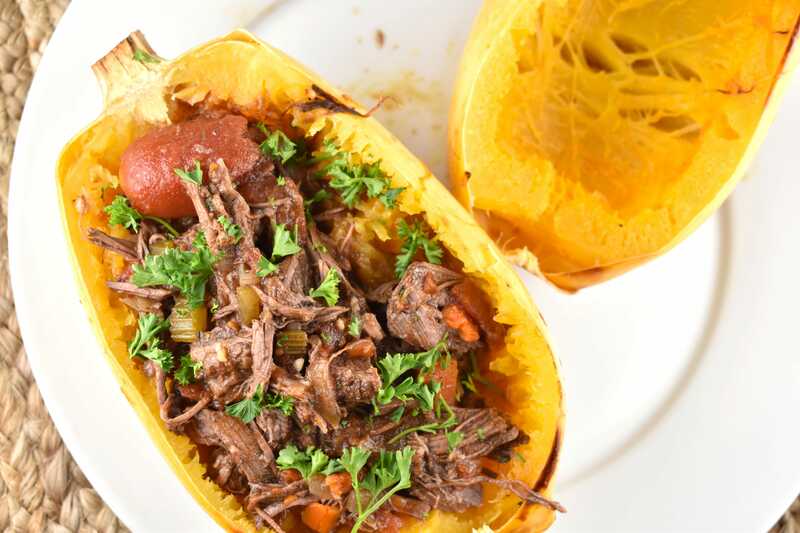 If you aren’t a fan of spaghetti squash, you can also serve this beef ragu over zucchini noodles (Zoodles) or any other spiralized veggies, egg noodles, polenta, orzo, or as part of a bowl with roasted veggies. You can get creative here. No matter what you serve it over, it will be hard to put your fork down. Of course the most important part, is to have the best, most delicious tasting beef ragu, because then it won’t matter what you serve it on! And this ragu has a TON of flavor. Seriously. It DELIVERS. I wanted it to be rich, hearty, and dense, so that it felt indulgent and satisfying. And I also wanted to make it quickly! Using my Instant Pot allowed me to get this dish done in a little less than an hour, which is WAY faster than the traditional slow cooker method. Ever since I introduced Instant Pot Recipes on my LaaLoosh earlier this year, I’ve received tons of requests asking for more recipes using it. And if you aren’t a member of the club yet, just use this Instant Pot affiliate link to head on over to Amazon and grab yourself one! I’m telling you, I cannot get enough of my Instant Pot – especially when I want to cook something that involves beef. The high pressure makes the meat SO tender and juicy in just a fraction of the time. My Instant Pot and I will be BFF’s forever. This is the type of meal you’ll want on a chilly night, and since some of you are still getting snow this time of year (yikes! 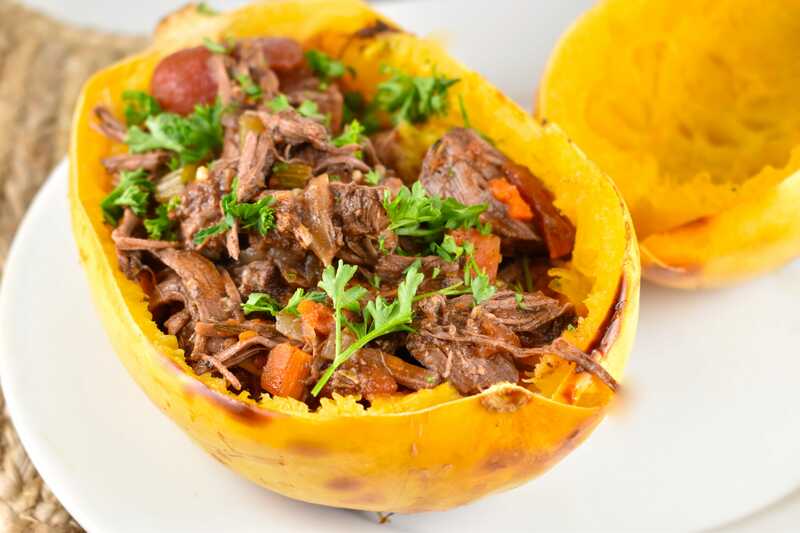 ), grab your pressure cooker, and make this Instant Pot Beef Ragu with Spaghetti Squash stat! You won’t regret it, and I hope you’ll love it as much as my family did. WANT MORE BEEF RECIPES? TRY THESE! Throw together this incredibly versatile dish in no time with your Instant Pot. 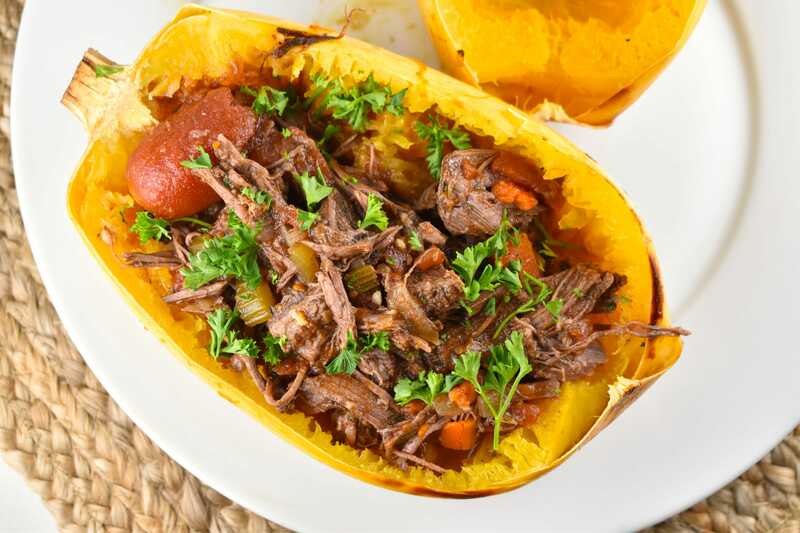 Depth of flavor, succulent beef, and a rich, decadent sauce that is served atop roasted spaghetti squash for a light, yet filling meal. Preheat oven to 400. Line a baking dish (or two) with parchment paper. Cut spaghetti squash in half lengthwise (making 6 halves total), and scoop out the seeds. Mist lightly with an olive oil mister or cooking spray, and season generously with salt and pepper. Place squash cut side down in baking dish, and place in oven. Cook until tender, about 45 min to 1 hour, depending on the size of the squash. Remove from oven and allow to cool. 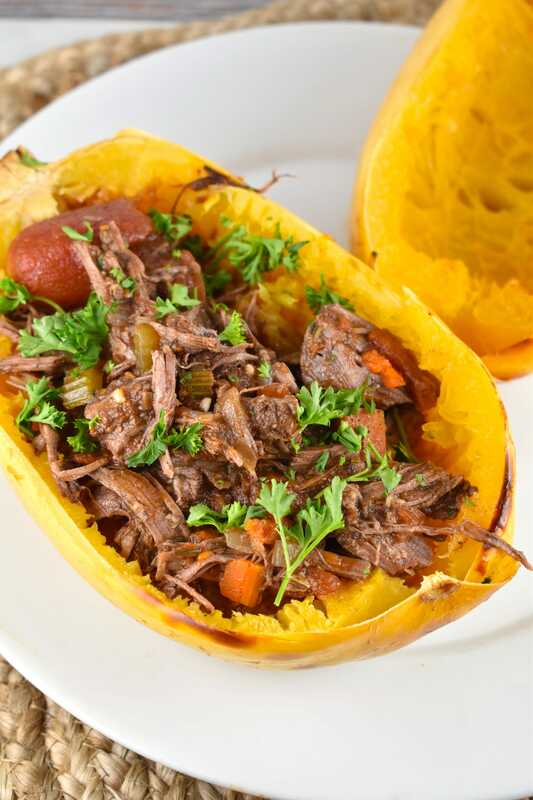 While our squash is roasting, let Instant Pot to saute mode. When add in olive oil. Then add in the onions, carrots, and celery. Saute for about 2-3 minutes. Add in all remaining ingredients, and stir it around a bit to combine. Turn off saute and cover with lid. Set Instant Pot to Meat/Stew mode and cook on high pressure for 35 minutes. Allow to naturally release until pressure valve is down. Open lid and shred beef with two forks. If you would like the sauce to be thicker, just set Instant Pot back on saute mode, and cook until the sauce begins to thicken. Once spaghetti squash is cool enough to handle, scrape the squash into strands with a fork. Transfer strands to a serving bowl, or keep in the squash shell and use as a bowl. Top each spaghetti squash half with 1/6th of the beef ragu and sauce. Garnish with fresh parsley and grated parmesan cheese, if desired.